Great Scott! Its Lougher at the double. In the race postponed from Monday, early leader Roy Richardson was black flagged on the first lap at Parliament Square. By the time the leaders reached the Bungalow, Ian had took the race by the scruff of the neck and, with an opening lap of 107.999 mph he led the race by over seven seconds from Chris Moore with Stuart Garton 3.5 seconds back in third. Lougher and his team adopted an early refuelling tactic and he came in at the end of the first lap thereby handing the race lead to Moore who opted to go on through to start his second lap. But there was no panic in the Lougher camp. At Ramsey, Moore led by over 43 seconds but by the time they completed their second circuit Lougher had reduced the deficit to just over 28 seconds and, with Chris having to pit for fuel, Ian was effectively the new race leader designate. Indeed, by Glen Helen on the final lap Lougher was back in front by some 22 seconds and just as he did in the 500cc Classic TT on Saturday, he saved his best until last to notch up the fastest lap of the race at 111.064 mph, and in the process extend his race winning margin to over 53 seconds from Moore to register a superb 2014 Classic TT double. Garton was 9.9 seconds back in third with Tom Snow, Phil McGurk and David Hewson completing the top six. It was another virtuoso performance from Lougher with massive thanks going to Brian Scott for providing a brilliant bike. Earlier in the day the popular Welshman took part in the 350cc Classic TT where, despite limited track time on the much respected Team Ripley Land Racing Drixon Honda, he still rode to a solid fourth place finish. It's been a successful return to the Isle of Man for Ian, who despite 'retiring' last year, always hinted that he would continue to compete in selected events. 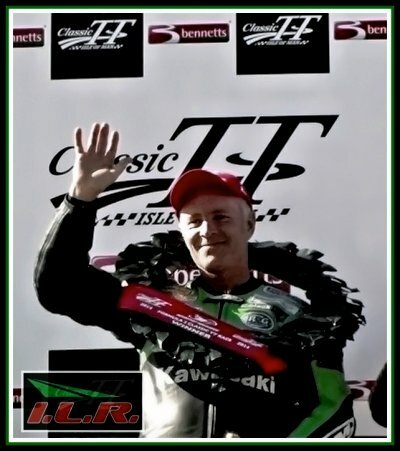 Photo: Ian Lougher on the Isle of Man Formula 2 Classic TT podium.